Borrowing from the impressive technology of the Kraken, we are pleased to introduce the A.S.P. 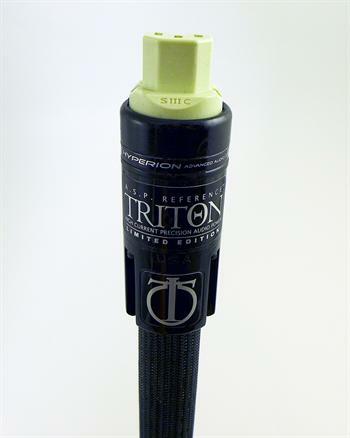 TRITON power cable. As does the Kraken, it employs the same exclusive conductor technology and geometry, same shielding materials, mechanical damping and proprietary HYPERION connectors. All these elements combined (as the Kraken) in a visually stunning piece of audio hardware. We developed entirely new, larger gauge AeroStrand Ultra™, air dielectric conductors especially for this cable design; so efficient they can carry more than 30 amperes without the bulk and stiffness of more traditional wire with equal current capacity. Being a slightly reduced version of the Kraken, the A.S.P. TRITON provides all the benefits (and almost all the performance) of the Kraken in a more compact and flexible design as well as a more accessible price. Power, definition and an amazingly low noise floor; while being a versatile match for virtually any quality audio component. A power cable that can truly enhance an audio system far more than any other in its price range. Transform your listening experience with A.S.P. TRITON power cable. A.S.P. TRITON power cables employ 4 large-gauge Cryo-treated, custom slow-extruded silver/palladium AeroStrand Ultra™ ribbon conductors. Air dielectric with FEP Teflon air-tubes. H.D.A. 100% radiation invulnerable foil. Each conductor + 2 plated silver ground wires individually shielded with silver plated braid. Multi-layer construction with silica/ceramic/ferrite mechanical damping/shielding layer. Custom handmade polymer-filled, carbon fiber plug housings help eliminate external vibrations. Exclusive Hyperion Ceramic plugs with Silver/Copper alloy electrical contacts, Palladium plated and Cryo-treated (custom made by Stage III Concepts).